Maytenus 'Silky Showers' is a superb garden plant originally found in the warm, partially shaded valleys of the Little Karoo. It grows to about 10 m high in these valleys and displays long cascading branches adorned with delicate, small leaves that shimmer in the breeze. The leaves are much smaller and narrower than most examples in the Cape. The overall impression one gets is of the fine trees illustrated in traditional Chinese paintings. This evergreen tree is quite variable growing up to 15 m tall in sheltered positions or reaching a height of only 1.5 m in exposed places. The trunk is appreciably thickened at the base and the grey or reddish brown bark may be furrowed in old specimens. The young branches are slender, and bear alternately arranged, drooping leaves. Some of the most attractive specimens are the old gnarled plants growing in remnant afromontane forests on the high scree slopes of the Cape mountains. These trees exude age and atmosphere with their adornments of old man's beard lichen. The young shoots are reddish in colour becoming grey or grey-brown with age. The leaves may be either ovate (egg-shaped and attached to the stem at the broad end), elliptic (oval and narrowing to the ends) or narrowly lance-shaped with pointed tips. They also vary in size from 13 to 100 mm long and 6 to 40 mm wide. 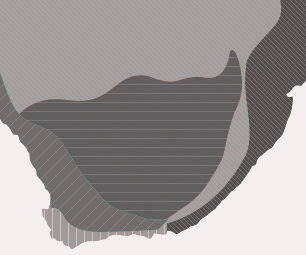 These differences are evident from area to area or even tree to tree. 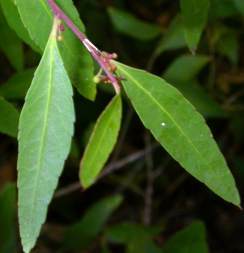 The leaves are darker green on the upper surface with margins that may be toothed or untoothed. The leaf is often used to identify this species. Silky elastic threads become visible if the leaf is folded and gently split. These threads hold the broken parts attached to each other even after the two sections of the leaf have been pulled apart. These threads are also evident when the bark is broken and separated. Insignificant, small flowers are produced in the axils of the leaves in summer and are small, cream-coloured, yellow-green or reddish. The fruit is a small, 1-3-lobed capsule and when produced in great numbers gives the tree an attractive orange hue. The capsules split open to reveal a small seed surrounded by a fatty orange aril. This aril is popular with birds, which aid distribution of the seed. Maytenus acuminata var. acuminata occurs south of the Zambezi River to the Western Cape, whereas a second variety, var. 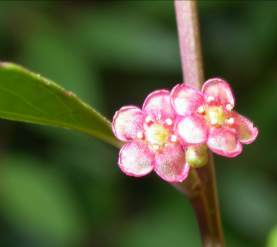 uva-ursi, is confined to Mount Mulanje in Malawi. M. acuminata is a relatively common, small, evergreen tree, growing in forest or forest margins, often along stream banks in well-drained, sandy and acidic soils. It is also found growing as stunted specimens on cliffs and rocky outcrops on mountain slopes up to 1 500 m.
The name Maytenus is based on the Chilean common name Mayten. The specific name is derived from the Latin acuminatus, referring to the tapering point of the leaves. Maytenus acuminata is a lovely small tree for gardens protected from strong coastal wind or from frost. It may be planted in full sunlight or light shade. A mature specimen will be a lovely and somewhat unusual feature tree in your garden. Maytenus 'Silky Showers' is a particularly good selection of this species with its fine, cascading branches. This plant also has the potential to be an excellent bonsai subject. Plant in a well-drained medium consisting of a mixture of course river sand, well-rotted compost and some of the natural garden soil. Feed regularly with an organic fertilizer or slow-release chemical fertilizer such as 3:1:5 (SR). Add bonemeal and superphosphate to the medium when planting in the ground. Maytenus acuminata is easy to propagate from fresh seed. Collect the seed when the capsules are splitting and revealing the orange fruit. Remove the soft aril by washing the fruit in clean water. The remaining seed is small and should preferably be sown when fresh and during the warm summer months when the plant is in active growth. Sow the seed in trays in a well-drained seed mixture consisting of two parts well-rotted compost, one part river sand. It is recommended that you pre-treat the seed with a pre-emergence fungicide to control damping off. This is usually applied by placing a little fungicide powder in a paper bag with the seed, closing it and shaking the packet. A fine layer of fungicide adheres to the surface of the seed and greatly helps prevent infection during the early stages of germination. Make sure that you are careful not to inhale the fungicide dust. Place a dust mask over your mouth and nose if possible. Sow the seed evenly over the surface and lightly cover with soil medium and water gently. Place the seed tray in a warm, ventilated and well-lit position. Keep the medium moist, but not too wet or dry. Seedlings should begin to appear after 8-10 weeks. Prick the individual seedlings out into individual pots when they are about 20 mm tall. This species can also be propagated from cuttings. Take cuttings in spring or early summer. 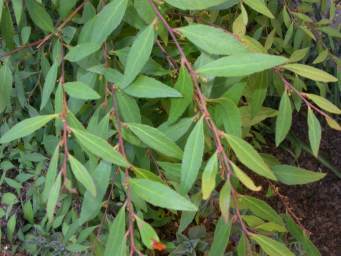 Heel or tip cuttings using semi-hardwood cuttings is recommended. This method of propagation is recommended for growers with access to heated mist propagation units. The cuttings are rooted in a well-aerated medium consisting of milled semi-decomposed pine bark and perlite or polystyrene balls. Use a rooting hormone for semi-hardwood cuttings.